The signpost at Exit 260 at the Las Vegas - Salt Lake City Interstate I-15 states it in bold letters: Springville Art Museum, Next Exit. 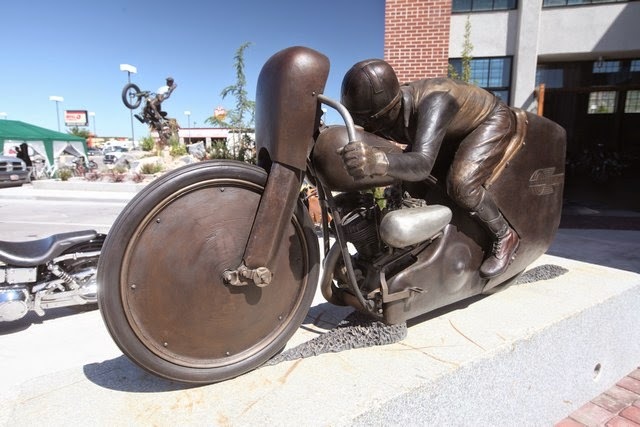 What it does not state, at least not yet, even closer to the exit – basically just out of the east side of the exit – is one of the finest collections of Motorcycle Artwork in the State of Utah, if not in the entire USA. 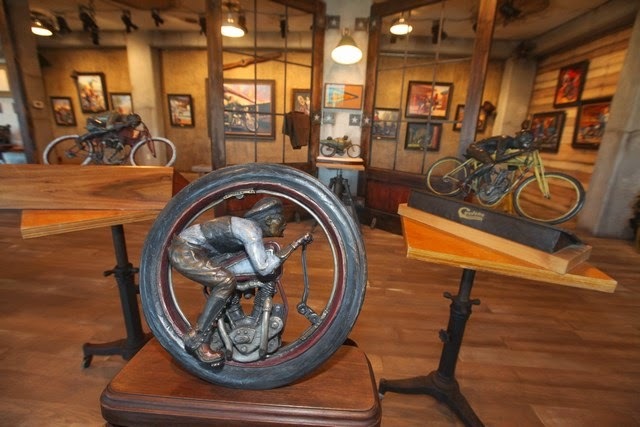 Rick Salisbury, owner of Legend Motorcycles, has spend a fortune to create a adequate showcase for his collection of painted and sculpted Motorcycle Art and his collection of classic Motorcycles that span from the earlyest days of transportation in the 20th Century to today. 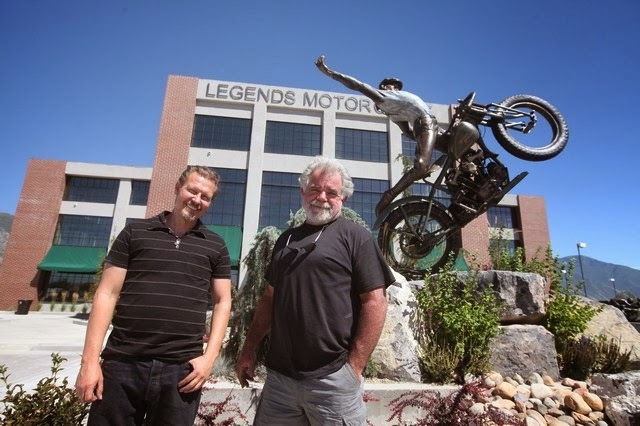 Legends Motorcycles has been a part of the Springville Scene for the better part of 2 decades, with Rick and his team offering service from a scenic faciltiy in downtown Springville, not to far from where Jeff Decker operates his famouse "Hippodrome Studio" and his wife the "Art Trolley" Restaurant. 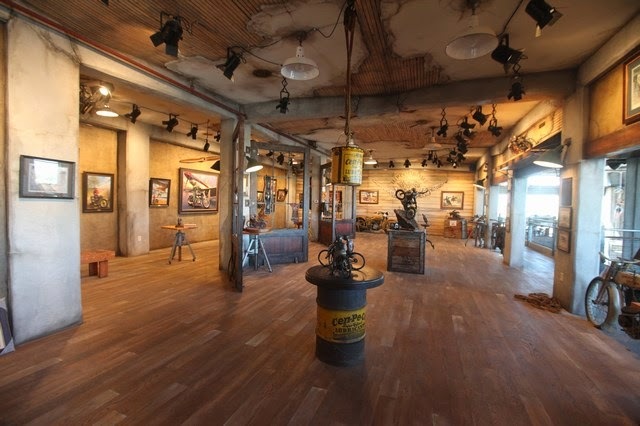 When a local car dealership next to the I-15 exit, Rick took the chance to expand and give his collection a new perspective and showcase. 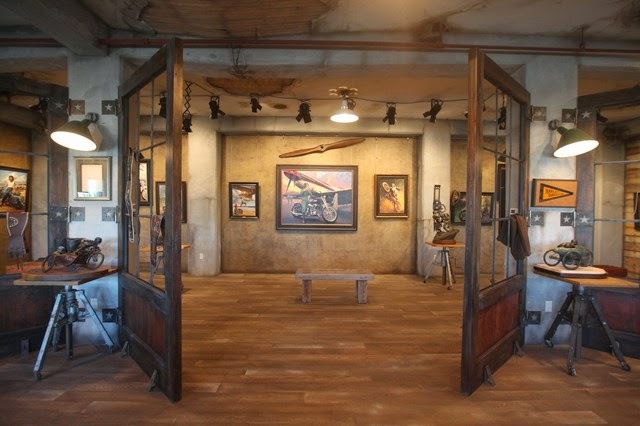 The building was extensively re-modelled and the first floor serves completely as Art Gallery. 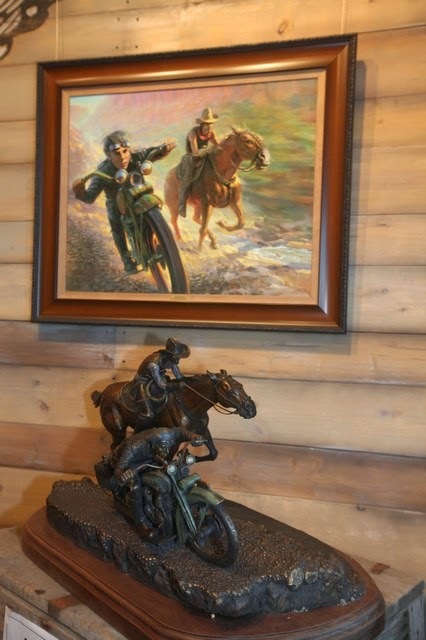 A dedicated collector of Jeff Decker's Bronce Sculptures, the cllection features more than 22 original Jeff Decker bronces, including a complete "Boardtrack Race", the gargantuan "Petrali Knuckle" AND a new 1:1.5 Hillclimber as it is the welcome Piece at the Harley-Davidson Museum at Milwaukee, created by Jeff in create secrecy for the opening of the Museum in 2008. A different colour-accented but impressive in size and quality DAH Hillclimber is now outside the Legends Motorcycles shop. 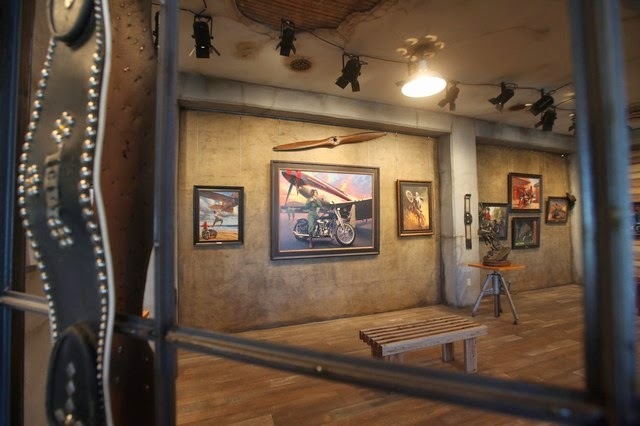 David Uhls Paintings – often supported by the fitting original bikes – are a major part, as are Tom Fritz, Scott Jacobs and a number of yet to be made famous artists. 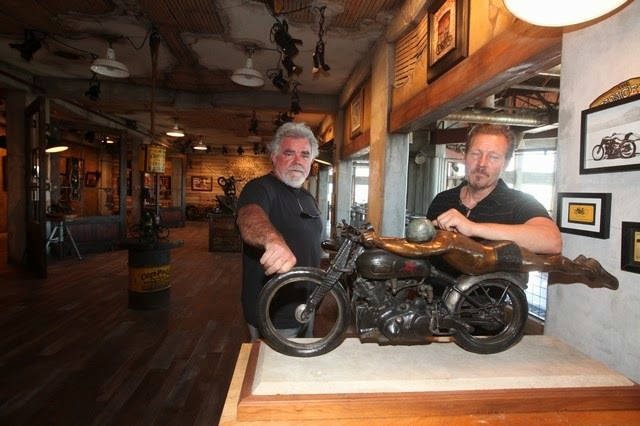 The lower floor presents part of Rick's Motorcycle collection – most of which already has or will be in riding condition – as well as some of the custom motorcycles that "Legends" has created as "Aftermarket V-Twins" in recent years under the brandname "Legend Motorcycle" and which are still available on demand. 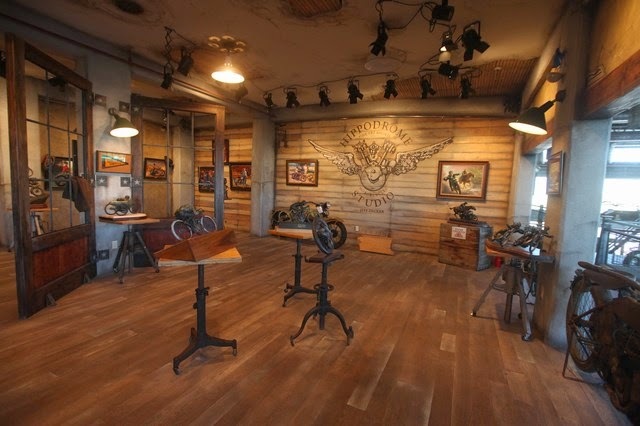 The actual work- and machineshop, where service and maintenance is provided, takes probably only 1/3th of the ground floor, but they take on all types of classic American Motorcycles, not just new and old Harley-Davidson's. 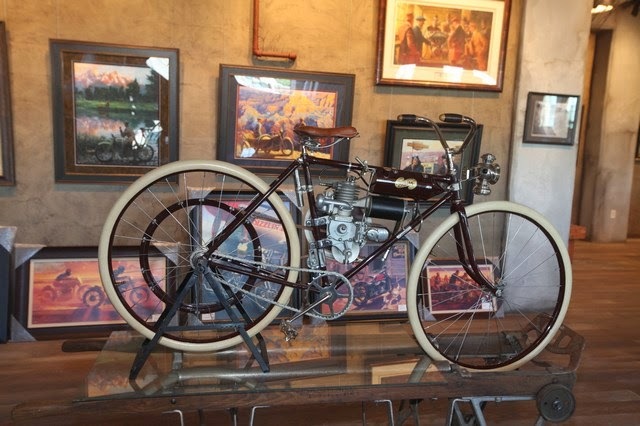 Highlights of he Museum are incredible original condition Indians and Harley-Davidson's, A super-rare Indian "Despatch Tow" in original paint and quite a number of American brands you may have never heard off. 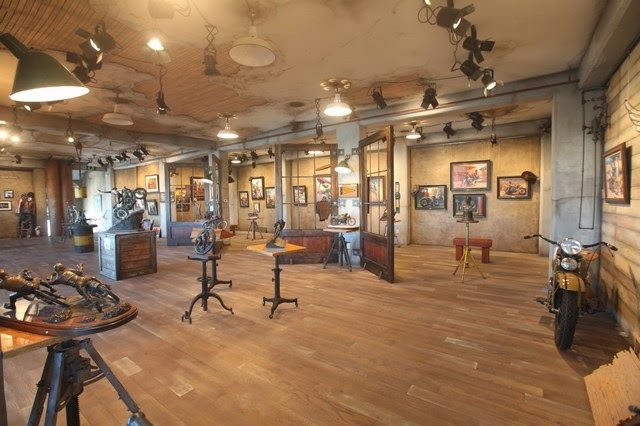 With the move from the previous downtown Location at Springville in May/June 2014, the Gallery/Museum is open to the public and the workshops fully operational. The huge parking lot – just opposite of the local Walmart – is also used for public gatherings: The weekend of August 17th saw the first-ever swapmeet outside Legends, an event that is expected to grow, thanks to the perfect traffic connetions. 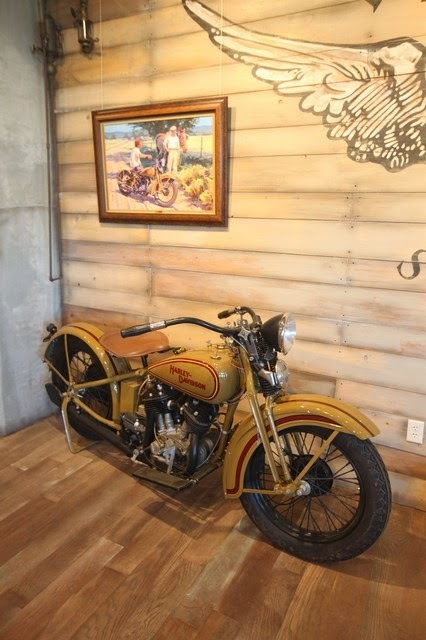 Professional homebuilder Rick Salisbury decided to turn his main hobby and lifelong passion for vintage motorcycles into a full-time business and is not stopping here: He will be on the 2014 Canonball Run for Vintage Motorcycles across the USA, accompanied by Jeff Decker. 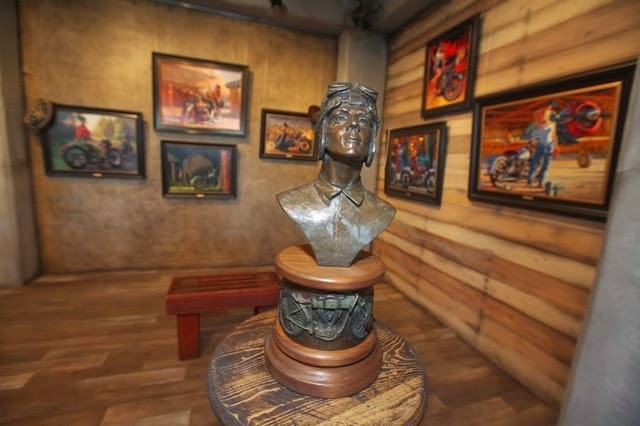 And there are even more art pieces waiting to be exhibited in the Museum! 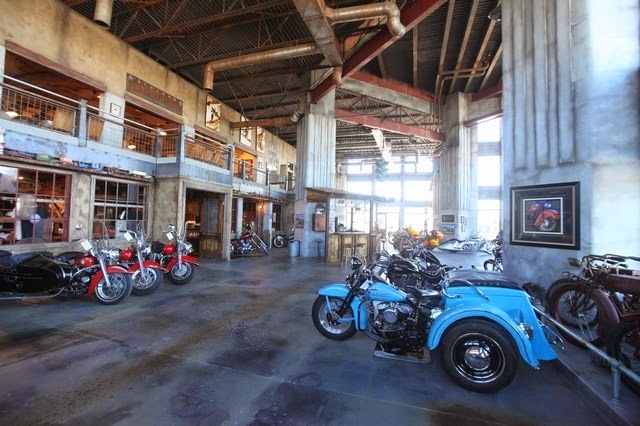 This is one stop every Motorcycle Enthusiast has to make: I-15, Exit 260 – you won't regret it!